Lisa Mensah joined USDA Rural Development State Director Vicki Walker, local officials, and representatives from the nonprofit Community Home Builders to tour the homes being built by rural Oregonians through the self-help method in Lafayette. LAFAYETTE, Oregon, June 29, 2015 — Agriculture Under Secretary for Rural Development and Oregon native, Lisa Mensah, concluded a visit to the state by meeting six families who are building their way to homeownership in Lafayette, including the 50,000th family in the nation to build their own home through USDA Rural Development’s Mutual Self-Help Housing Program. This afternoon, Mensah joined USDA Rural Development State Director Vicki Walker, local officials, and representatives from the nonprofit Community Home Builders to tour the homes being built by rural Oregonians through the self-help method in Lafayette. 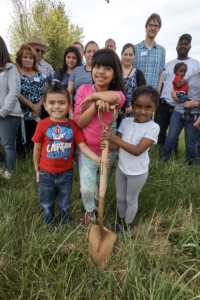 USDA Rural Development’s Mutual Self-Help Housing Program offers families with modest means a hands-on approach to achieve homeownership by providing grants to help local organizations carry out housing construction or rehabilitation projects in rural areas. The local sponsor in Lafayette, Community Home Builders, is using a USDA technical assistance grant to develop a site, secure the assistance of a professional contractor, and provide construction coordination and training. The current group of participants consists of six families and marks the 200th family aided by Community Home Builders over the years. The families, working side-by-side on nights and weekends, perform approximately 70 percent of the construction on each other’s homes, buying down the price through their sweat equity. USDA Rural Development is also providing each qualified participant an affordable, low-interest mortgage to cover the remaining cost of the homes. “Here in Oregon, since the start of the Obama Administration, USDA Rural Development has made or guaranteed loans for nearly 17,000 rural families, representing a total investment of $2.7 billion,” Walker said. Since 2009, USDA invested more than $117 billion nationwide to support rural homeownership. Last year alone, USDA invested $19.9 billion to help nearly 140,000 rural families buy and maintain homes. In addition to the Self-Help Housing Program, USDA Rural Development offers direct home loans, loan guarantees, and home repair loans and grants to help qualified families in rural America achieve the dream of homeownership. To learn more about USDA’s observance of National Homeownership Month, please visit ourFacebook page, or contact a Rural Development office near you for additional information about our housing programs. At the start of her visit to the state, Mensah traveled to Bend to meet with partners and discuss strategies for strengthening rural communities across Oregon. On Friday, she attended the Regards to Rural Conference, where she gave the keynote address, speaking about the need to build collaborations across regions and among the various sectors serving rural communities, as well as the importance of establishing long-term, integrated, holistic approaches to community economic development. USDA Rural Development is a key partner in this effort, having invested more than $3.5 billion in rural Oregon since the start of the Obama Administration. This annual conference, presented by the nonprofit Rural Development Initiatives, is focused overall on strengthening the economic vitality and social vibrancy of rural communities, a topic close to Mensah’s heart. Mensah was nominated by President Obama for the position of Under Secretary of USDA Rural Development and confirmed by the U.S. Senate in November of 2014. Mensah provides leadership for three USDA agencies charged with improving the economic well-being of rural America: the Rural Housing Service, the Rural Utilities Service, and the Rural Business and Cooperative Service. Together, these agencies make up the Rural Development mission area of USDA, providing critical infrastructure investments in the form of loans and grants for rural housing; high-speed broadband access; telephone, electric, and water utilities; renewable energy generation and conservation; local and regional food systems; community facilities; and small business development in rural America. President Obama’s historic investments in rural America have made our rural communities stronger. Under his leadership, these investments in housing, community facilities, businesses, and infrastructure have empowered rural America to continue leading the way—strengthening America’s economy, small towns, and rural communities.